From Cincinnati to Mount Hope GPS says is 290 miles. Highway most of the way but then it has me on back roads again. I'm going past farms in Amish country. 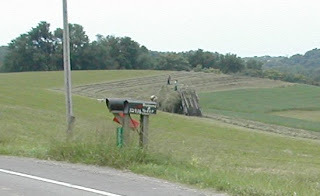 I stopped to take this picture because I haven't seen a hay loader since the 50's when we used one on the farm. No horses then though, my father pulled the trailer with a 1932 Farmall and I was on top of the load packing it away. I'm passing horse drawn wagons, then along comes a huge tour bus. These people's everyday lives are a tourist attraction. Well, I stopped too. GPS tells me I have arrived. I'm at a crossroads, got no clue where I am. I keep driving until I come to a main road. There is a farm store for tourists ahead, cars fill the parking lot. This is where the tour buses are coming from. I ask one of the bus drivers where I am and where is Mount Hope. She doesn't know where Mount Hope is but I find out where I am. Back in the van I get out the Atlas. It takes awhile but I find Mount Hope on the map, about 20 miles away. I'm watching the numbers on the mail boxes as I approach Mount Hope. When I get to where Weaver Leather is supposed to be, it's a field. In Mount Hope itself the post office is closed. I ask where Weaver Leather is at the hardware store. The guy doesn't know, he isn't from here. I ask a lady in a bonnet, that looks like she is from here. Its back down the road... at a wider part of the road that they call something or other... take a right and it's up there. That reminds me of the European commedian doing a sketch about how Americans give directions. "You go down this street until you come to where Mikes Barber Shop used to be, then turn left...". I'm going back up the road looking for a place it's wider. At a cross road there is a blinking light, this must be it. Ok, I found it, I go inside. Place is practically deserted, only a couple girls on the phone. I find out that the auction is farther up the road behind the building. They are setting up for it. The auction doesn't start until tomorrow but I want to check it out in advance. It seems I'm not the only one. Lots of lots of leather. This auction is going to take all day. The leather is odd lots and batches of culls. I've been there done that... I'm not buying. 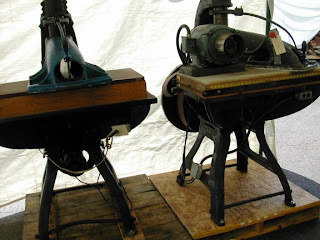 The next tent is the machinery. 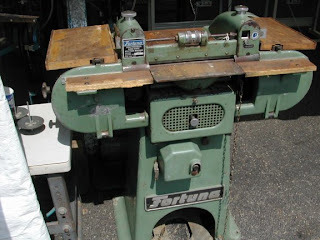 Maybe some of this stuff can be made to work but I don't need it and don't need to wait two days until the machinery part of the auction. All day the weather report has been for rain, large hail and maybe tornadoes. Time to head home. GPS says take a left onto a country road. I'm headed south on a road with double yellow lines on it. I stay headed south. She tells me to take a left on every side street I pass. I'm back at the tourist stop still headed south. GPS finally comes around to my way of thinking. The GPS directed me through the Cincinatti trafic flawlessly and told me I was at my destination in front of a construction site. I called Newman Leather... "You aren't really in Cincinnati like it says on your letterhead and on your web site? Oh a suburb.. different zip code and everything..hummm. Same street name though? I'll be there shortely". Couldn't blame that on the GPS could I. Need to find a gas station real quick though. When I find one on the right, GPS tells me to turn left. A half hr. later I pull in behind their warehouse. I haven't been in a place like this in years. Thousands of square feet of leather neatly stacked in numbered bins. Their sample swatches have the bin numbers on them...really well organized operation. I find a nice brown and a black for handbags, load a few bundles into the van, write a check and I'm off for weaver leather. 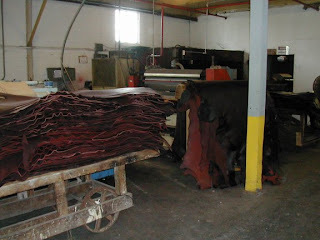 After the tannery it was off to Triple C leather. The GPS had me on some of the narrowest back roads. At one point I had to ford a creek, I was wondering if the pavement was going to turn to gravel road. It finally told me I had reached my destination in front of a dilapidated barn in a field. I could as well have been in N. Dakota from the way it looked. After trusting the GPS instead of keeping track of where I was I could have been there for all I knew. I had been driving for hours. Well the name of the road was correct, the numbers on the broken down mail boxes were all wrong though. I decided I was at the wrong end of the road and headed off over hill and dale. Well what do you know, all of a sudden there was a place that looked like it wasn't abandoned. I had arrived at their warehouse. Unfortunately they only had about 50 picked over shoulders that I was looking for... the kind of thing I get when I when I phone in an order. I left without buying anything and headed for Cincinnati. I've been ignoring the handbags because I had lost my leather supplier. I had given up on the handbags for months. I finally decided that I had to do something about it and the Weaver Leather annual auction was the trigger that set me off. Weaver is in up state Ohio and I'm in Georgia so it was to be a good road trip. I wasn't going to just go there. This was to be a visit to several suppliers along the way. The first stop was Radio Shack for a GPS. I left the next morning at 3:00 am GPS wanted me to drive to Atlanta and then up the highway to Chattanooga. I ignored that and headed across lots for Cleveland GA then west. Eventually the GPS came around to my way of thinking. Tennessee tanning was the first stop. They are the real deal old time tannery. The last time I was at some place this real was in Lhasa Tibet. 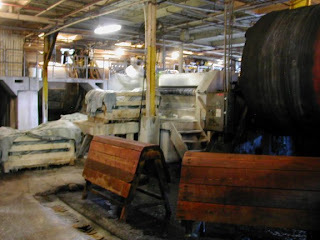 The tannery smell, the hides, and the old equipment were something to behold. We looked at hides, they showed me the processes they could do, and gave me a tour. A pile of finished hides on the left and workers opening a stack of the blue "crust" they start with. It was dark in there which added to the aura of the place but it meant that my camera used a slow shutter speed. The worker at this machine is removing the flesh from the back of the wet hides. The blade has to be sharpened twice a day. I was told that this guy, in the years that he has worked there has "fleshed" over a million hides. 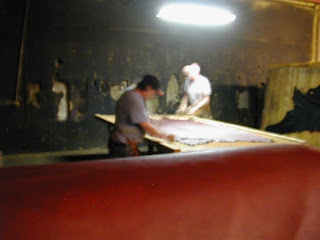 Here they are stretching out the wet tanned hides and nailing them to a piece of wood. It takes a couple days for them to dry. The final step is measuring the number of square feet. 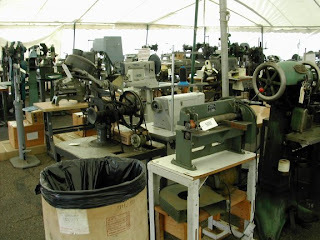 It is done mechanically as the leather is fed through this machine. If there is leather there the lever is up if it isn't the lever is down. 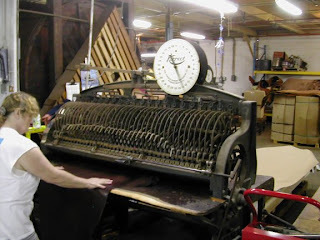 The dial at the top records the amount of leather going through the machine. The machine is calibrated daily by running a piece of known size through the machine. 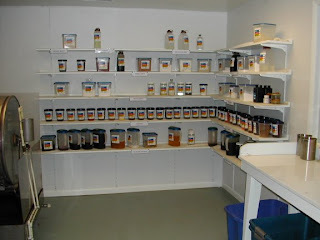 Tanning is a chemical process that has a lot of variables. 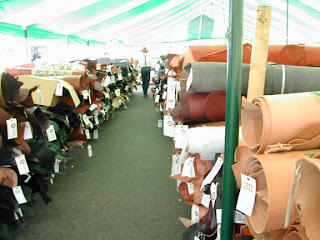 Over the years they have found formulas to produce different types of leather. To reproduce the same leather every time they have to control the variables, one of which is the water they use. They have their own wells from which they have been getting the water they use for tanning for over 100 years. 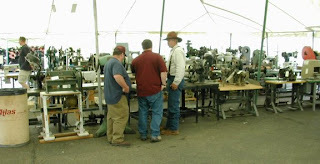 To test the leather and the solutions throughout the process they have their own testing lab. I have been working in leather since 1970. In 1971 I opened my first leather shop and in 1972 I moved into my own restored building and became ‘The Norwich Leather Co. By the 80’s I owned and ran a factory making Handbags, Shoes, Jackets, Vests, Wallets, etc. for my store as well as for other individuals and companies who sold them as their own. I have also done extensive work with sails, upholstery, and canvas awnings on yachts. This experience has given me insight into the creative possibilities of combining leather with state of the art sail making technology and products. The waterproof bonded lining fabric is a result of this experience. This lining is actually as strong and well suited to it's purpose as the leather itself. I have sailed thousands of miles off shore, many of them alone, from Nova Scotia to Grenada, in China Clipper a 36 ft. sail boat. Today as LeatherGoodsConnection.com I design and make leather goods to sell directly to the public.